Attorney General Eric Holder signed off on a controversial search warrant that identified Fox News reporter James Rosen as a “possible co-conspirator” in violations of the Espionage Act and authorized seizure of his private emails, a law enforcement official told NBC News on Thursday...The law enforcement official said Holder's approval of the Rosen search, in the spring of 2010, came after senior Justice officials concluded there was "probable cause" that Rosen's communications with his source, identified as intelligence analyst Stephen Kim, met the legal burden for such searches. "It was approved at the highest levels-- and I mean the highest," said the law enforcement official, who spoke on condition of anonymity. He said that explicitly included Holder. Attention, America: Eric Holder -- the man who authorized a truly shocking and intrusive warrant designed to pry into the news-gathering methods of a journalist -- "shares the president's concerns" about freedom of the press. Good to know. And aren't you comforted that Holder has been tasked with reviewing...his own actions and "reporting back" to his boss by mid-summer? Slate's Dave Weigel wins the day with this headline: "Eric Holder Will Lead Investigation Into Journalist Warrant That he Approved." What a farce. Obama has unwaveringly expressed full confidence in Holder, even after his amnesia- and ignorance-addled testimony last week. 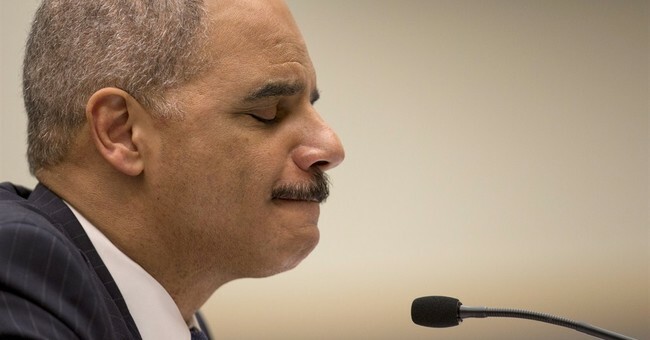 The last few weeks have prompted low murmurs among influential Democrats about dumping Holder. Let's see if this revelation nudges him closer to the path of Obama's proverbial bus. "You can’t look at this and see it as anything other than an attempt to basically scare anybody from ever leaking anything every again. So, they want to criminalize journalism, and that’s what it’s coming down to. If you end up essentially criminalizing journalism when it comes to reporting on the federal government, particularly on national security, and the only place they think they technically can do that is on the issue of national security, what it’s going to do is the impact that we’ve heard the council say this over the weekend: It is going to make whistleblowers and people that might leak and regular sources." James Goodale, the First Amendment lawyer who represented the New York Times in the Pentagon Papers case, wrote the following this week: "The search warrant filed to investigate the Fox News reporter James Rosen proved as many had suspected: President Obama wants to make it a crime for a reporter to talk to a leaker. It is a further example of how President Obama will surely pass President Richard Nixon as the worst president ever on issues of national security and press freedom."